The book opens in 1968 with a woman who dies while giving birth on a train; the passenger who assists her claims the child for herself. It then switches to the narrative of Baptiste Molino, a therapist living on a houseboat moored on the edge of Toulouse. He is with his a new client Amandine Rousseau who has visited him because she has heard he makes people happy. "I don't believe anyone else can make you happy," is his gentle, considered reply, "But you can be helped to find your own way there." Amandine wants to feel alive, to fall in love. And from this point, the thoughtful, benevolent, compassionate Baptiste who spends his time helping his clients to navigate through their own stormy waters- never making waves of his own - is entranced by the enigmatic Amandine. For the first time he finds himself unable to "see" into a client, unable to "solve" her problem and identify what it is she needs. We are also introduced to Sophie, a young waitress at the local bar. She and Baptiste are close and "after hours of dealing with doubt and hesitation her unshakeable self assurance was like a cold shower at the end of a hot day." They "recognised something in each other that fit like salt on butter or lemon on fish." Sophie wants to help Baptiste rediscover love and passion, to explore the world rather than hiding behind his clients; to find more meaning in his life rather than helping others search for meaning in their lives. There is some beautiful imagery and metaphor in this book - in fact it is swimming in it. I loved the comparison of Baptiste with a kingfisher. Unlike other creatures who only see themselves when they look into water, the kingfisher sees right down below the surface to everything that is beneath. "This," Sophie observes, "is what you do with people." There are some recurrent images about birds ("Flocks of little black notes migrating like starlings across the page", "Words fluttered as though caged in my mind. I didn't know which ones to set free.") and of course, the numerous references and descriptions of water are essential given the placement of the houseboat and the themes of freedom, memory, life, exploration, adventure and time. Baptiste is very philosophical and reflective. I liked how his nights are full of ideas as he tries to process his sessions with his clients: "In the slow drift into sleep when the mind softens and unravels, intuition speaks.....dawn will decide if they make sense." The writing feels quite hypnotic - heightened by the closeness of water and the sense of floating on soft waves and a continuous gentle rocking. The language is creative and metaphors are used by the characters and the author to explore the idea of love. There are some fantastic allegories for love. Baptiste's mother asks him if he thinks love is like a butterfly, "that you have to catch....no, love is like a garden, you have to put your mind to it and grow it." Different characters have different experiences of love to share with him. Baptiste's friend Etienne says love has make him happy, yet miserable, changed him for the better and for the worse. Amandine says love is "spending your waking hours being terrified of losing what is most precious to you." 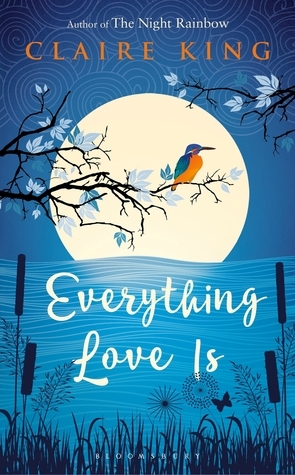 This is a novel about love - and everything love is. It is a love story but not in the conventional sense. It is up to Baptiste to discover love and all its happiness, pain, joy and sorrow. The relationships between the characters is very well written. These are people with a deep understanding of each other. A gentleness with each other. A connection with each other. Baptiste's parents give him excellent counsel and so does the youthful and aspirational Sophie. There is also the interjection of an anonymous voice between Baptiste's chapters and to be honest, I spent a while wondering whether I had missed something vital as I wasn't completely sure who the voice belonged to and how it fitted in with the story. However, keep going and all becomes very clear, and when it does, the novel becomes something much more powerful and poignant. My relationship with the characters became more involved and I was caught up in the sadness of the plot. I think King's deliberate technique to make the reader feel like they aren't fully grasping the unfolding of events, the chronology or how the pieces of the jigsaw fit together is effective. It works well because of the author's exploration of memory, loss, confusion and love. Her writing about memory is powerful and there is some very compelling descriptions. There is a dream like quality to this slow, considered novel. The french location adds a little more mystique and I definitely was reminded of novels such as "The Red Notebook" , "The Reader on the 6.27" and "The Little Paris Bookshop." King's writing is comparable to Joanne Harris and Maggie O'Farrell. My thanks to NetGalley for the advanced copy of this novel in return for a fair and honest review. For more recommendations and reviews, please follow me on twitter @katherinesunde3 (bibliomaniacUK) or sign up to receive future posts via email.